Wiwatpanit, T., Lorenzen, S. M, Cantú, J. A., Foo, C. Z., Hogan, A. K., Márquez, F., Clancy, J. C., Schipma, M. J., Cheatham, M., Duggan, A., and García-Añoveros, J. Trans-differentiation of outer hair cells into inner hair cells in the absence of INSM. Nature (In Press). Wiwatpanit, T., Remis, N. N., Ahmad, A., Zhou, Y., Clancy, J. C., Cheatham, M., and García-Añoveros, J. (2018) Co-deficiency of Lysosomal Mucolipins 3 and 1 in Cochlear Hair Cells Diminishes Outer Hair Cell Longevity and Accelerates Age-Related Hearing Loss. J. Neurosci. 38 (13) 3177-3189. (Cover Article). PMID: 29453205. Tan, X., Jahan, I., Xu, Y., Stock, S., Kwan, C., Soriano, C., Xiao, X., García-Añoveros, J., Fritzsch, B., and Richter, C.-P. (2017). Auditory Neural Activity in Congenitally Deaf Mice Induced by Infrared Neural Stimulation. Scientific Reports 8 (1), 388. PMID: 29321651. Lorenzen, S. M., Duggan, A., Osipovich, A. B., Magnuson, M. A. and García-Añoveros, J. (2015) Insm1 promotes neurogenic proliferation in delaminated otic progenitors. Mechanisms of Development 138, 233-245. PMID: 26545349. Flores, E.N., Duggan, A., Madathanyi, T., Hogan, A. K., Márquez, F. G., Kumar, G., Seal, R., Edwards, R., Liberman, M. C. and García-Añoveros, J. (2015). A non-canonical pathway from cochlea to brain signals tissue-damaging noise. Current Biology 25 (5), 606-612. PMID: 25639244. -Research Highlight: Noisy Nociception. Nature Rev. Neuroscience. -The Washington Post: That ringing in your ears? Don’t assume it will just fade away. -ScienceDaily: A Bodyguard for your Ears. -Northwestern Medicine: Auditory Pain Pathway May Protect Against Hearing Loss. -AARP: Are Your Ears Trying to Protect Themselves? Remis, N. N., Wiwatpanit, T., Castiglioni, A. J., Flores, E. N., Cantú, J. A. and García-Añoveros, J. (2014). Mucolipin Co-deficiency Causes Accelerated Endolysosomal Vacuolation of Enterocytes and Failure-to-Thrive from Birth to Weaning. PLoS Genetics. 10 (12). E1004833. PMID: 25521295. -Rare Disease Report: Study Indicates Lysosomal Disorder May Lead to Failure to Thrive in Infancy. -Northwestern Medicine: Lysosome Dysfinction Linked to Infant Failure to Thrive. Wiwatpanit, T. and García-Añoveros, J. (2014). TRPML2 and mucolipin evolution. Handbook of Experimental Pharmacology 222, 647-58. PMID: 24756724. Castiglioni, A. J., Remis, N. N., Flores, E. N., and García-Añoveros, J. (2011) Expression and vesicular localization of TRPML3 in stria vascularis, hair cells, vomeronasal and olfactory receptor neurons. J. Comp. Neurol.519 (6), 1095-1014. PMID: 21344404. Flores, E., and García-Añoveros, J. (2011). Trpml2 and the evolution of mucolipins. Advances in Experimental Medicine and Biology 704, 221-228. PMID: 21290298. *Rosenbaum, J. N., *Duggan, A. and García-Añoveros, J. 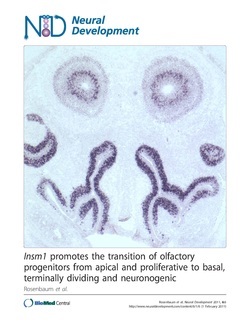 (2011) Insm1 promotes the transition of olfactory progenitors from apical and proliferative to basal, terminally-dividing and neuronogenic. Neural Development 6(1):6. PMID: 21284846. Zheng, L., Zheng, J., Whitlon, D. S., García-Añoveros, J. and Bartles, J. Targeting of the hair cell proteins cadherin 23, harmonin, myosin XVa, espin and prestin in an epithelial cell model. J. Neurosci. 30 (21), 7187-7201. PMID: 20505086. Tannous, B. A., Christensen, A. P., Pike, L., Wurdinger, T., Perry, K. F., Saydam, O., Jacobs, A. H., García-Añoveros, J., Weissleder, R., Sena-Esteves, M., Corey, D. P. and Breakefield, X. O. (2009). Mutant sodium channel for tumor therapy. Molecular Therapy 17, 810-819. PMID: 19259066. Cornell, R., Aarts, M., Bautista, D., Garcia-Anoveros, J., Kiselyov, K. and Liman, E. (2008). A double TRPtych: six views of TRP channels in disease and health. J. Neurosci. 28 (46), 11778-11784. PMID: 19005039. Duggan A., Madathany, T., de Castro, S. C. P., Gerrelli, D., Guddati, K. and García-Añoveros J. (2008) Transient expression of the conserved zinc finger gene INSM1 in progenitors and nascent neurons throughout embryonic and adult neurogenesis. Journal of Comparative Neurology 507 (4), 1497-1520. PMID: 18205207. Nagata, K., Zheng, L., Madathany, T., Castiglioni, A. J., Bartles, J. R. and García-Añoveros, J. (2007). The varitint-waddler (Va) deafness mutation in TRPML3 generates constitutive, inward rectifying currents and causes cellular degeneration.Proc. Natl. Acad. Sci. USA. 2007 Dec 27 (Epub ahead of print). PMID: 18162548. García-Añoveros, J. and Nagata, K. (2007). TRPA1. Handbook of Experimental Pharmacology 179, 347-362. PMID: 17217068. García-Añoveros, J., and Duggan, A.(2007). TRPA1 in auditory and nociceptive organs, in TRP Ion Channel Function in Sensory Transduction and Cellular Signaling Cascades (Liedtle, W. and Heller, S., Eds), Chapter 12, pp 163-175. CRC Press, Boca Raton, FL - New York, NY. PMID: 21204497. Nagata, K., Duggan, A., Kumar, G., and García-Añoveros, J. (2005). Nociceptor and hair cell tranducer properties of TRPA1, a channel for pain and hearing. J. Neurosci. 25 (16), 4052-4061. (Cover Article). PMID: 15843607. Sage, C., Huang, M., Karimi, K., Gutierrez, G., Vollrath, M. A., Zhang, D.-S., García-Añoveros, J., Hinds, P. W., Corwin, J. T., Corey, D. P, and Chen, Z.-Y.Proliferation of functional hair cells in vivo in the absence of retinoblastoma protein. Science 307, 1114-8. PMID: 15653467. *Corey, D. P., *García-Añoveros, J., *Holt, J. R., *Kwan, K Y., *Lin, S.-Y., *Vollrath, M. A., Amalfitano, A., Cheung, E. M.-L., Derfler, B. H., Duggan, A., Géléoc, G. S. G., Gray, P., Hoffman, M. P., Rehm, H. L., Tamasauskas, D., and Zhang, D.-S. (2004). TRPA1 is a candidate for the mechanosensitive transduction channel of vertebrate hair cells. Nature 432, 723-730 (Epub 2004 Oct 13). PMID: 15483558. Duggan, A., García-Añoveros, J. and Corey, D. P. (2002). The PDZ domain protein PICK1 and the sodium channel BNaC1 interact and localize at mechanosensory terminals of dorsal root ganglion neurons and dendrites of central neurons. J. Biol. Chem. 277, 5203-5208. PMID: 11739374. 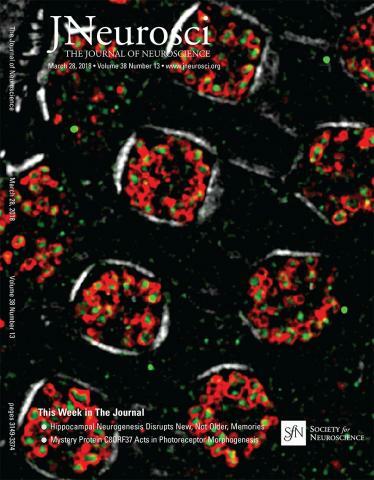 García-Añoveros, J., Samad, T., Žuvela-Jelaska, L., Woolf, C. J., and Corey, D. P. (2001) Transport and Localization of the DEG/ENaC Ion Channel BNaC1α to Peripheral Mechanosensory Terminals of Dorsal Root Ganglia Neurons. J. Neurosci. 21 (8), 2678-2686. PMID: 11306621. Duggan, A., García-Añoveros, J., and Corey, D. P. (2000). Insect mechanoreception: What a long, strange TRP it’s been. Current Biology 10, R384-387. PMID: 10837217. García-Añoveros, J., García, J. A., Liu, J., and Corey, D. P. (1998) The nematode degenerin UNC-105 forms ion channels that are activated by degeneration- or hypercontraction causing mutations. Neuron 20, 1231-1241. PMID: 9655510. García-Añoveros, J., and Corey, D. P. (1997). The molecules of mechanosensation. Annu. Rev. Neurosci. 20, 567-594. PMID: 9056725. García-Añoveros, J., Derfler, B., Neville-Golden, J., Hyman, B. T., and Corey, D. P. (1997). BNaC1 and BNaC2 constitute a new family of human neuronal sodium channels related to degenerins and epithelial sodium channels. Proc. Natl. Acad. Sci. USA 94, 1459-1464. PMID: 9037075. Hall, D. H., Gu, G., García-Añoveros, J.,Gong, L., Chalfie, M., and Driscoll, M. (1997). Neuropathology of Degenerative Cell Death in Caenorhabditis elegans. J. Neurosci. 17, 1033-1045. PMID: 8994058. Corey, D. P., and García-Añoveros, J. (1996). Mechanosensation and the DEG/ENaC Ion Channels. Science 273, 323-324. PMID: 8685718. García-Añoveros, J., and Corey, D. P. (1996). Mechanosensation: Touch at the molecular level. Current Biology 6, 541-543. PMID: 8805263. García-Añoveros, J., Ma, C., and Chalfie, M. (1995). Regulation of Caenorhabditis elegans degenerin proteins by a putative extracellular domain. Current Biology 5, 441-448. PMID: 7627559. Otsuka, A. J., Jeyaprakash, A., García-Añoveros, J., Tang, L. Z., Fisk, G., Hartshorne, T., Franco, R., and Born, T. (1991). The C. elegans unc-104 Gene Encodes a Putative Kinesin Heavy Chain-Like Protein. Neuron 6, 113-122. PMID: 1846075.